There aren't many things that can cheer a kid up more than a beeping and booping R2-D2 replica. 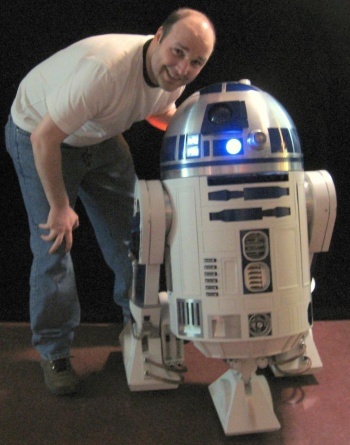 Maine resident Paul Bussiere was once challenged by a friend to build a replica of Star Wars' R2-D2 to prove that a little man wasn't controlling it from the inside, and he turned the project into a way to cheer up sick kids. After taking four years to construct his own version of the droid, now Bussiere regularly brings it into the Eastern Maine Medical Center pediatrics unit, where it has become a special visitor. Building an advanced droid like R2-D2 may have been complicated in decades past, but isn't anymore thanks to the internet. Bussiere says "I stumbled onto an R2-D2 builders [Web] page. I've always been a computer person, so I thought, 'Wouldn't it be cool to build something like that? How hard can it be?" There are multiple groups out there dedicated to building R2-D2 replicas, which is almost a necessity as ordering parts normally requires putting in an order at a machine shop. According to Bussiere: "You need to accumulate 40 to 50 specific parts. Then you use the standardized blueprint and all the pieces fit together." Bussiere is a help desk associate at the Eastern Main Medical Center, so after he completed his R2-D2 he came up with the idea to use it to elevate more than his own spirits. He now brings his replica into the hospital, where it's first inspected and disinfected, and brings it around to visit sick children, whom usually request a special visit. The R2-D2 has extra safety features as it's used around kids, but it has authentic sounds and plays 90 songs stored in a hard drive. George Lucas won't be bashing down Bussiere's door anytime soon, because Bussiere says his and other replica R2-D2s are authorized by Lucasfilm "as long as we're not trying to make a profit." On the contrary, Bussiere has spent more than $5,000 to build his R2-D2, and he's not done yet. Bussiere's next goal is to figure out a way to make the droid project a representation of Princess Leia's holographic plea for help to Obi-Wan Kenobi shown in Star Wars Episode IV: A New Hope. I have a feeling his droid might be even more entertaining for kids than Lucasfilm's upcoming animated series. Thanks for the submission ThaBenMan!